At the motel desk, I bumped into Thirsty Boots, an older hiker I hadn’t seen since Southern California. He said he was leaving the trail due to a foot injury. I liked him, and wished him well on his journey home. There was a snafu at the front desk with regards to my package – it wasn’t there. I called my wife and asked her if she sent it out on time, and she assured me she did; in fact, she had a tracking number that said it had been delivered to the post office the day before. Bottom line, the motel owners hadn’t gone to the post office to pick up hiker packages. The post office was next door to the motel, and I went there and retrieved the box. There were chores to do in town, and I had to hurry to get everything accomplished – shower, laundry, sort through the resupply box and repack the contents into the backpack, visit to the grocery store for additional supplies, namely milk, cookies and chocolate pudding, and a haircut. Strangely enough, there were no barber shops in Mammoth Lakes, only salons. I found one by the grocery store and walked in. I asked the counter clerk how much for a three-minute buzz, knowing full well that a custom salon haircut can run as high as twenty-five dollars. She shouted to one of the hair stylists my request, and the answer came back - ten dollars. I accepted the offer, and five minutes later I walked out with a buzz that would last me until I crossed into Canada. I’d been on the road eight days, ever since leaving Independence, and getting a shower and putting on clean clothes put new life into a journey that was getting old quick. I only stayed in town one night while some hikers will stay two, but as always, I felt the urge to keep moving. Before leaving the next morning, I searched out a restaurant and ordered the biggest breakfast I could find on the menu. I was amazed at how much food I was consuming, yet still losing weight. I must be feeding a tapeworm. By 11:00 a.m., I was standing next to the Mammoth Lakes Ski Resort trying to hitch a ride back to Red’s Meadow. With me were two other hikers – both in their midfifties – Lucky Man and Purple Haze. Within a few minutes, a couple stopped and offered to take all three of us back to the trailhead at Red’s Meadow. Lucky Man and I decide we had to have a chocolate milk shake before getting back on the trail, so we headed back to the café at Red’s Meadow, while Purple Haze headed on up the trail. The shake was delicious, and under the circumstance worth it, but at eight dollars, it was the most expensive milk shake I would have on the trail. I like to read maps, as well as study them. I have an REI store close to my home in Salt Lake City, and one of my favorite pastimes when I’m in the store, is to go to the map section and pull out various topo maps and figure out how to access an area I might like to visit. Southern Utah is a hiker’s paradise, but it takes a good topo map and knowledge of how to read it to take advantage of all that the red-rock canyons have to offer. Often trails don’t exist, only landmarks, which are like cairns that show the way across slickrock sandstone – a prominent knoll here, a water hole there, a dry streambed that leads to the head of a canyon where piled-up rocks that look like a staircase will give access to ledges above. 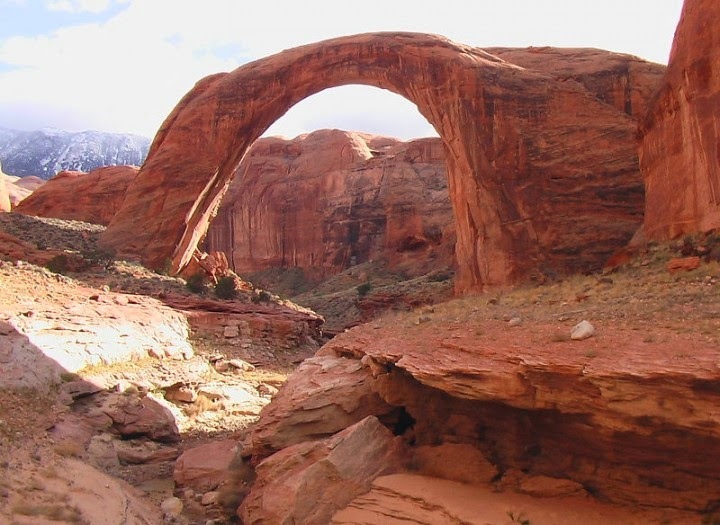 In 1958, as a boy scout in Glen Canyon, now Lake Powell, I found a little-used trail that continued under Rainbow Bridge and into unknown canyons. While the rest of my group played in the waters beneath the bridge, I followed the trail upstream, to see what was around the next bend. The trail followed beside the stream that eventually flowed under the bridge. About a mile into my exploration, I came to a wide spot in the trail that at one time was the site of a well-established camp. I found the remnants of wooden floors, bed springs, stud walls, sheepherder stoves and assorted trash – rusted cans and bottles – evidence that someone had gone to a lot of trouble to establish an elaborate rest area for campers or tourists. I counted the remains of four wooden floors and concluded that the camp could have accommodated twelve to sixteen campers plus guides. I was quite certain that whoever used this camp hadn’t accessed it by the river, for in 1958, scouts were about the only passengers that floated the Colorado River, and besides, it was a seven-mile hike from the river to the bridge. From stories I’d heard from our leaders around the campfires in the evening, I learned about Navajo Mountain, and concluded that this camp and its visitors had to have come from the Navajo Mountainside of the Colorado River. It was a mystery and remained so for many years. Sometime in the mid-1980s, after I was well established as a river outfitter, I read an article in the local paper about a horseback trip that had departed from the Rainbow Lodge adjacent to the Navajo Mountain Trading Post and traveled to Rainbow Bridge. The article went on to explain that the trip had been put together by a local outfitter to commemorate and recreate pack trips that had made regular excursions to Rainbow Bridge beginning in the 1920s and continuing through the 1950s, until the lodge burned down in 1951. This was part of an old trail that prominent people like Zane Grey – western outdoor novel writer, and Teddy Roosevelt had traveled to view Rainbow Bridge in 1913. After reading the newspaper article, I took a week off from the office and traveled to the Navajo reservation and followed the dirt roads out to the trading post at Navajo Mountain which was now more of a convenience store that sold gas. The Rainbow Lodge had been rebuilt, and I met the current owner, a cattle rancher from Kanab, Utah. He told me that after Rainbow Bridge had been discovered in 1909, interest in visiting the bridge increased dramatically. He said that S.I. Richardson and his son, Cecil, built the trading post and lodge in 1924, and began offering tours to the bridge via horseback. It was fourteen miles one way, and the Richardsons built two camps along the route to accommodate clients – one at seven miles along the trail, and the other at the end of the trail, just before the trail opened up to views of the bridge. The remains of this second camp are what I discovered as a fourteen-year-old boy in 1958. Mystery solved. Rainbow Bridge. When I first hiked to the bridge in 1958, there were ropes dangling from the cliffs off to the right of the bridge which enable us scouts to climb down to the bridge and walk out on top of it. In 1959, on my second trip to the bridge, I brought a balsa wood glider airplane with me, that I carried to the top and assembled. I was confident that once launched from the bridge, it would be one of the world's longest glides for such a toy aircraft. Gingerly, I tossed it off the bridge; but the wind picked it up, carried it behind me, to a small ledge several feet below me, and completely out of my reach, and there it stayed.